Introducing VoluTurn, Celeritive's new science-based rough-turning solution available for SIEMENS NX CAM. The software easily creates science-based toolpaths -- eliminating the need to use CAD geometry such as lines and arcs. VoluTurn is a powerful new toolpath technology that can significantly improve the machining of any part that is turned using round inserts and offers manufacturers the ability to significantly increase productivity by reducing cycle times while also reducing wear on cutting tools. 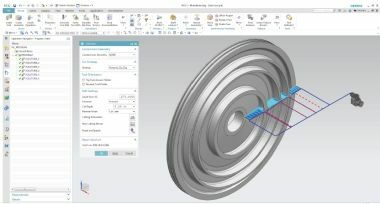 VoluTurn will also increase productivity for manufacturers by greatly reducing man-hours for programmers who are currently required to manually create toolpaths by using CAD geometry, such as lines and arcs, to drive cutting tools. VoluTurn is targeted at the types of parts most commonly associated with the power-generation industry, but will be equally effective in any industry that faces similar challenges related to complex toolpath creation and difficult-to-machine materials.